In June a Link of the Week featured student critiques of the online education program at Western Governors University. Gerry McGovern at a higher education conference in Spain had asked: “Where are the authentic student reviews on university websites?” Almost no colleges and universities include authentic student and alumni ratings as part of their content strategy. WGU was a rare example. Learning about individual academic programs is a Top Task for virtually every potential student. But aside from PR blurbs, finding credible content on what students and alumni think about a particular program is almost impossible on a school’s website. What is “authentic,” non-PR content? In brief, ratings that don’t imply that everything about a college or university is simply wonderful. Heaven doesn’t exist on earth no matter how much college and university view book and website content strives for that impression. That’s why people dismiss so many marketing claims. Today we feature a more in-depth example of authentic student reviews than those at WGU: Ratings for individual academic program. Why did Concordia do this? The “star rating” is immediately visible as an academic programs page opens, along with the total number of ratings that produced it. Anyone who has ever checked product ratings at Amazon will recognize the 1 to 5 star system used here. Much better to do this than to use a 1 to 10 scale or a letter system. The ratings are strong but not perfect. For the 11 ratings categories, the highest level is 4.5 (for 5 categories) and the lowest is 4.0 (for “Quality of technology integration”). Individual comments, on the other hand, all have 5 stars next to them and are almost unfailingly laudatory. Somewhere there might be a handful of comments from people who gave ratings between 4.0 and 4.5. We checked several other programs as well and all have a similar ratings spread, adding to the overall credibility. We even found one rating of 3.8… for “Adequacy of classroom resources” in Biology (with an overall rating of 4.4). 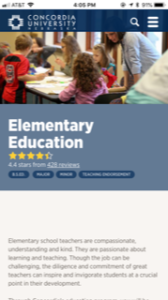 Google Test My Site gives the Elementary Education page a “Fair” 7 second mobile download time, estimating visitor loss at 27 percent. 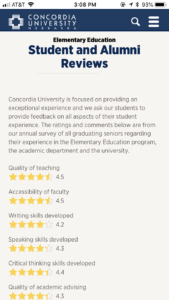 Start your review of student and alumni academic program critiques at Concordia University, Nebraska when you visit the Elementary Education site. Join 646 people on the Top Tasks: Higher Education Website Content group on LinkedIn.